In the middle of March 2010 BMO came out with a new Mastercard offering to compete with the Visa Infinite cards issued by other banks in Canada. Until then BMO has only offered Gold or Platinum versions of the various Mastercards they issued. One can assume BMO came out with this card for several reasons. The first is that BMO needed to keep its higher end clientele from jumping ship from their current line of cards to the premium Infinite cards offered by banks like CIBC and RBC. The second reason would be to try and pull some of the current Visa Infinite cardholders away from those other banks, particularly if they are BMO clients to start with. On January 15, 2018 the card underwent some changes which are reflected in this update of the review. 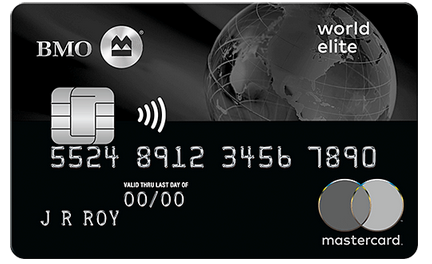 The BMO World Elite comes with a heftier $150 primary card annual fee versus the average $120 for many comparable cards including Visa Infinite cards. Currently the card has a limited time offer until April 20, 2018 where you will have the annual fee waived in the first year. The card offers a 35,000 point welcome bonus after spending $3,000 on the card in the first three months which is worth $250 in travel with the newly revised redemption rate of 140 points = $1. Supplementary cards run $50 which is the same for almost all of the Infinite/Platinum/Gold travel credit card offerings from other banks. The interest rate on the card is 19.99% which is in line with its competitors but most people who have this card will be paying off their monthly balances in full. On the redemption side, BMO originally made it tough to find out what the redemption ratios were for travel unless you are an actual cardholder. This was changed in 2013 when they set the redemption rate at 100 points = $1 towards travel. However this changed once again on January 15, 2018 when the card and rewards program were revamped.